IIITD: System Management: CPU-Z V/S DMIDECODE..and..HOW TO USE THEM? 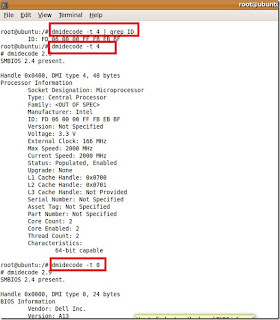 CPU-Z V/S DMIDECODE..and..HOW TO USE THEM? I wouldn't actually call it a post being posted here because amarjeet sir wanted it to be here on the blog..After all those discussions on the first post of this blog over how to get the details of your processor,ram,OS..etc just on the click of a button....and then later over utilities like CPU-Z and DMIDECODE..this had to be there..either as my personal assignment or some question in the class or as it was destined to be..As a post..titled--CPU-Z V/S DMIDECODE..What are these actually? ?how do I install them and use them? ?...I hope I end up clearing all your doubts..
Each computer is like a specific human being.. having a processor,ram,hard-disk,motherboard different from others in one or more ways...and getting into the details the complexity of each component increases..some of these computers might have pentium-4,some may have a dual core..the ram might vary from an obsolete SD-Ram to DDR1,2 and 3 Rams..the question is..I have all these locked under my laptop or in my cpu..how do I know what are the details of such components in the machine that I am using without any prior knowledge.. There are several ways to get to know that..however..the most user friendly ones are.. 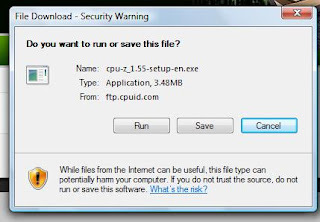 If you are working on a windows platform,you could just go to control panel/system...or a shortcut whould be right-clicking your MY COMPUTER icon and selecting properties and then device manager for details about each component, and driver details..
However,some OSs or some specific OS service packages do not provide the necessary information like the Ram type,or may be the the frequency of the Ram..(That's why some of you just couldn't get these details and commented for solutions on the post. This one is a kind of a universal method..which includes getting the data through the SMBIOS or System Management Basic Input/output System which is actually a special software that interfaces the major hardware components of our computer with the operating system.It is usually stored on the Flash memory chip on the motherboard, but sometimes the chip is another type of ROM. You can enter the BIOS by just pressing del or F-11,or F-12 key(depending on ur BIOS version and make) while starting up the computer before the OS boots..
However,Some BIOS interfaces from Pheonix and other firms..in some versions..do not provide the necessary,just like mine didn't.It may provide u with more than what the OS provides..but it's still not everything..
2- software level access: drivers, or Windows API. Method 1 is the most accurate, provides the most precise details, but it is dangerous and requires constant updates. Method 2 is safer, less accurate and easier. 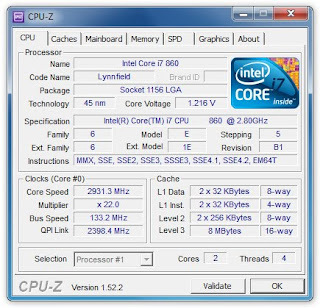 CPU-Z uses method 1 for CPU information. Now,There are also other similar utilities you can try out,close to how CPU-Z works. First of all,this command is only for use in LINUX. DMIDECODE is actually DMI table decoder.dmidecode is a tool for dumping a computer's DMI (some say SMBIOS ) table contents in a human-readable format. This table contains a description of the system's hardware components, as well as other useful pieces of information such as serial numbers and BIOS revision. Thanks to this table, you can retrieve this information without having to probe for the actual hardware. While this is a good point in terms of report speed and safeness, this also makes the presented information possibly unreliable. The DMI table doesn't only describe what the system is currently made of, it also can report the possible evolutions (such as the fastest supported CPU or the maximal amount of memory supported). SMBIOS stands for System Management BIOS , while DMI stands for Desktop Management Interface. Both standards are tightly related and developed by the DMTF (Desktop Management Task Force). CPU-Z is for Windows,DMIDECODE for Linux. The CPU-Z is an External utility downloaded from the web.But dmidecode is a command,used in the Linux terminal window. So,the Dmidecode tool may be called an internal utility of the Linux. CPU-Z is much more userfriendly as a software,compared to running commands in Linux. CPU-Z is highly detailed as it works in Ring 0 of window's kernal system,DMIDECODE itself doesn't get u all the needed,but some modifications in the command(available on google) can help u get almost everything. Do let me know if this was helpful,I know this was long, but I just couldn't help it. Comments and Questions are invited from all of you.If any one of you tries any of the above specified softwares,please share your experience with us. My pleasure.. :) BTW ya.. I installed that CPU-Z 5.5 and it was really helpful for me in order to know about everything but i didn't understand 1 thing in it.. Wat are those clocks in it?? n Wat does overclocking mean?? @Akanksha..just to add to what Nishant said..the clock time of a cpu (or processor) is abt the frequency at which it does the provided tasks..hope u are clear now.. I'm using Intel Core 2 Duo and have Windows XP OS. yesterday i found out that to access my BIOS, i had to press F2. Also, how do i find out what my BIOS version is? Shayan..Surprising to know u are running an XP over core 2 duo..try win 7,it will definitely increase the performance..try it..
About the BIOS version,When u enter the BIOS..It displays the name and version on top..but if u still can't find it.. Ya, i know that XP is obsolete these days. I upgraded to Windows 7 six months back but then when we went for MTNL wireless connection, we found that they dont have the ability to provide Wi-Fi to those who have Windows Vista or Windows 7!!!!!!!!!!!!!!! We haven't had good experience with the other network providers and hence prefer to stick with MTNL which so far has given a reasonable performance compared to the others. and i wud also like to comment that mtnl does have the best service around..atleast as compared to airtel and others..